As temperatures begin to dip in El Paso, I find myself spending more time outside before the winter chill starts to hit. This weekend, I hung out in my back yard with my dog, a Caldwell Last Tsar, and a bottle of FiftyFifty’s Eclipse 2013 Buffalo Trace Barrel Blend. 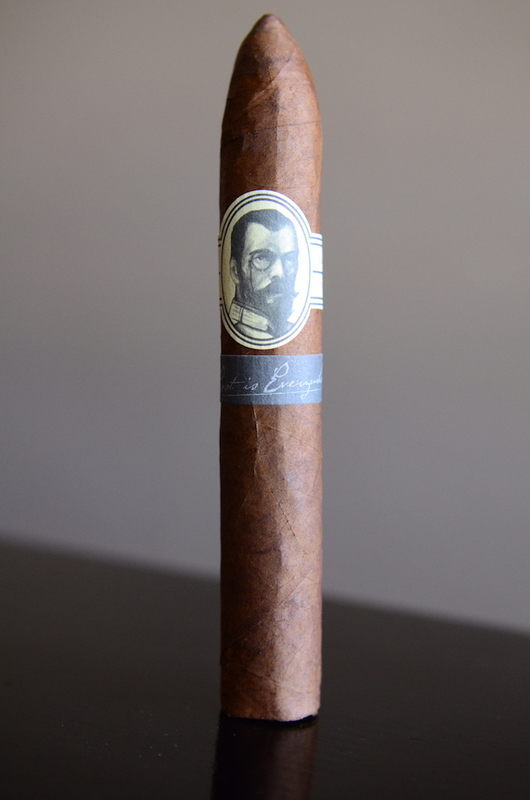 Caldwell Last Tsar is a very limited edition blend created to celebrate the first anniversary of the company. Only 500 boxes are made and are only distributed to the first 49 accounts that setup shop with Caldwell when they hit the market last year. The Last Tsar is blended at Tabacalera William Ventura using a Hybrid Connecticut Arapiraca Maduro wrapper and undisclosed binder and filler although there is some Carbonell tobacco mixed in. Up into recently the cigar was only offered in a single 5.5 x 52 format but there is a 7 x 47 churchill en route to retailers as you read this. This format will actually be released in 1,000 boxes vs the 500 of the original format. I am not sure what the price point on the Churchill will be, but this standard belicoso format runs $18 a stick. The wrapper on the Last Tsar is a sight for sore eyes. It’s meaty, thick, rustic, and looks as though it’s seen some better days. 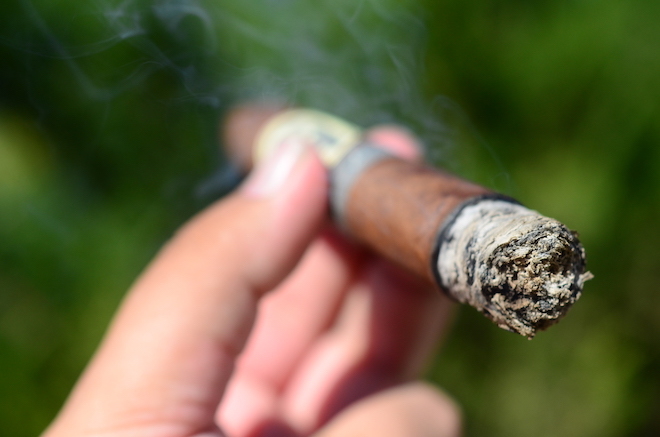 That being said, some of the best cigars out are wrapped in tobaccos that are less than appealing. Beauty aside, the wrapper on the Caldwell Last Tsar is a very dark, reddish brown in color which is consistent for the most part with some minor darker areas surrounding the natural webbing in the leaf. There aren’t a lot of oils present, but the wrapper does have a toothier texture and a very hard makeup. Not only is the wrapper hard, but the cigar is packed very tightly created a solid feel in my hand. 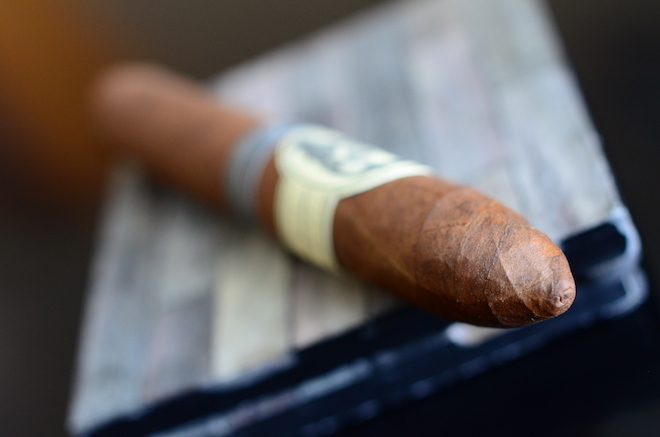 The cigar’s thick body leads of to a very sharp belicoso cap. 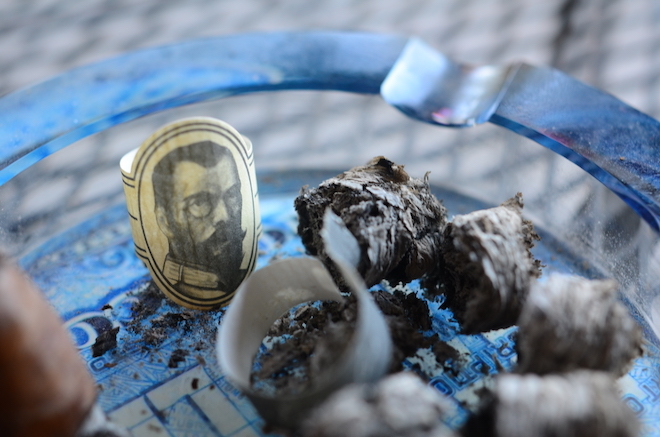 The cigar is polished off with a very elegant white/manilla band with a photo of Emperor Nicholas II of Russia on the front as well as a small secondary gray band which reads “East is Everywhere” on the front. 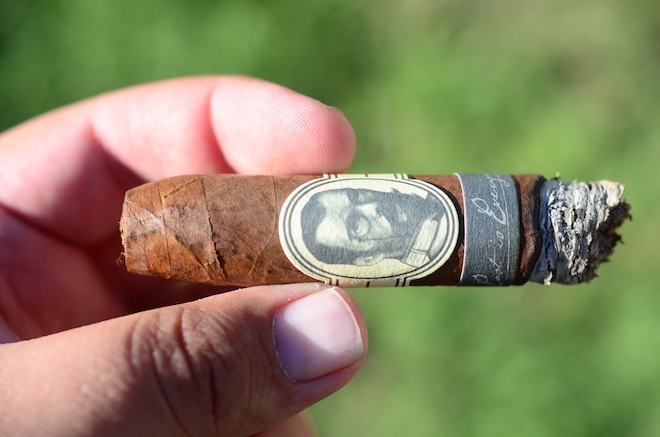 The Caldwell Last Tsar’s wrapper gives off a very bold, musk and spice aroma while the foot of the cigar has lots of natural tobacco, pepper, and spice. The cold draw produces a whole ton of pepper, so much that it left my tongue tingling before I even lit the cigar up. The pepper was backed by some coffee, and natural tobacco. The Caldwell Last Tsar starts out with some slight black pepper which quickly fades into a deep musk, espresso, oak leather, and spice. I was expecting a lot more of a pepper zing from this thing seeing how potent the pepper was in the cold draw. The draw is a bit tight, but started opening up more after about a half inch in. It’s now releasing a decent amount of thick, white smoke with each puff. It still takes a little more effort that I’d prefer, but if this cigar is anything like the other’s I smoked from the same box, they will open up as I progress through the experience. The draw line is a bit wavy leaving behind a trail of compacted white and medium gray ash. The first ash happened less than a centimeter in, but then held on for about an inch before giving way. As I expected the draw has really opened up in the second third of the Caldwell Last Tsar and so has the flavors. 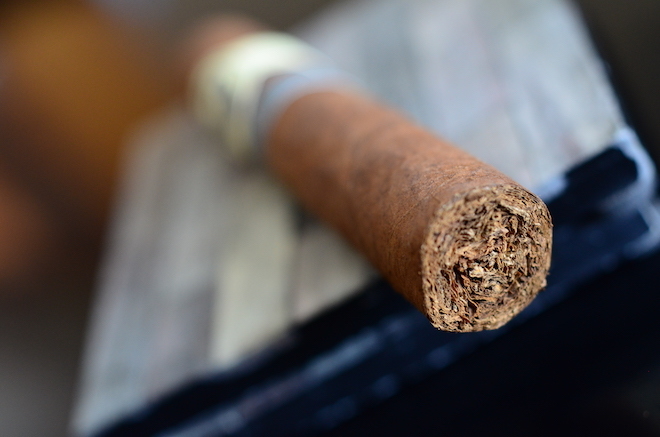 The cigar now boasts of deep oak, sweetness, blackberry, espresso and spice. It’s bold, but not over the top as the flavors really balance each other out. My pairing also introduces much more sweetness which helps push the profile. The retrohale is VERY sharp coating my nasal passage with a very strong pepper and oak. I won’t find myself doing it too often. The burn line has cleaned itself up quite a bit now and is now burning pretty even with some soft waves as I close out the second third with a very slight nicotine kick. The body and strength is still pouring on in the final third of the Caldwell Last Tsar. The flavors have gotten sweeter as the cigar progresses leading with oak and vanilla, backed by coffee, spice, and musk. I’m really enjoying the profile here. The strength has really taken a leap forward too. The burn line is still slightly wavy but I haven’t once had to touch up or relight the entire way. It took me about an hour and a half to take this cigar down to the nub (and I mean NUB, my fingers were on fire) and I close out with no harshness at all, no extra heat, and a decent amount of a nicotine kick. I was a bit skeptic going into the Caldwell Last Tsar. All the talk about a “bold”, “full bodied” cigar, while I thought Caldwell already had some bolder cigars in their portfolio had me wondering if the Last Tsar would be over-the-top strength, and no balance in flavors. I was wrong. 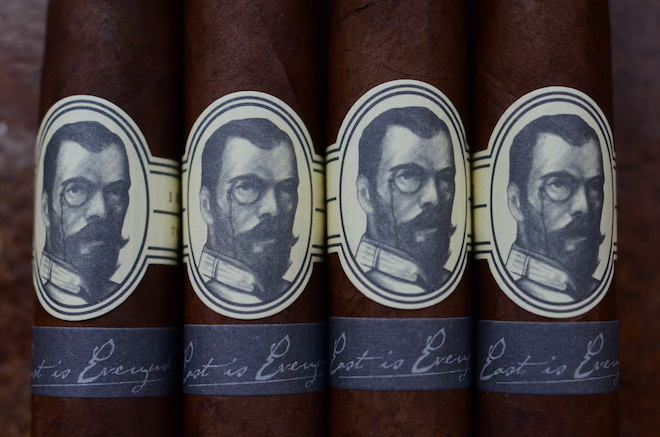 The Caldwell Last Tsar delivers a very bold, yet very balanced profile which preformed flawlessly. Each time I smoke a Caldwell it’s been better than the next, and the Last Tsar is no exception. It’s a bold cigar for sure, with a hefty price tag so it may not be the best choice for a novice cigar smoker, but I think any seasoned smoker who can appreciate the rare tobacco, with a full-bodied experience should pick up a few of these. They won’t be disappointed. FiftyFifty is the king of imperial stouts aged in various bourbon barrels. This particular selection was aged in Buffalo Trace barrels. The only way to tell which particular brew you scored is the distinct color differences on the melted wax around the beers neck. Coming in at 11.9% ABV this beer isn’t for the faint of heart. 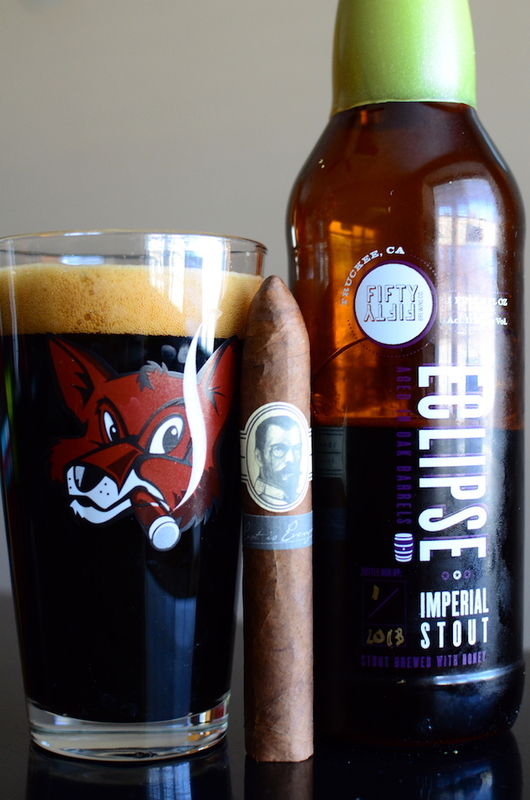 The FiftyFifty Eclipse leads with sweet vanilla, and milk chocolate with some slight barrel and a medium mouthfeel before finishing very sweet with lots of bourbon, oak, vanilla, malt, and chocolate with a very thick, sweet aftertaste. The beer really helped add a whole other level of sweetness to the flavor profile in the Caldwell Last Tsar. Other pairings would be any sweet, strong stout, a malty and sweet porter, or a sweet bourbon. These are ok…not worth the price if you ask me. Not sure why they made 2x as many boxes when the BelicosoX (actually a 5.5×52, it was changed from the original 5×50) is still very easy to find, considering the churchill size is less popular 500 boxes would have been plenty. 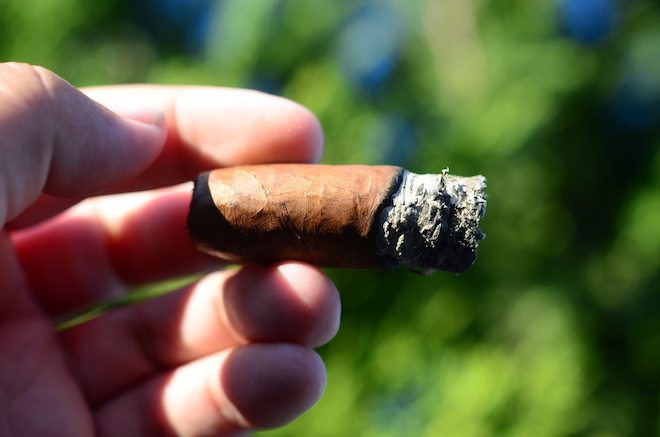 Anyways, great review…I do like the cigar (Carbonell is very good tobacco) but its sure not worth the price…. Good call on the size update, I’ll get it swapped out. I agree, the price is pretty steep. I’m really interested to see how the blind mans bluff turns out. I’ll get it in queue. These are easily my favorites from Caldwell. There aren’t too many cigars I’ll smoke regularly in that price point but I keep finding myself grabbing one off the shelf.